RADAR is a hosted email archiving service that operates in conjunction with your existing IT network to ensure the protection, preservation, and continuous operation of email communication for your business. With RADAR, users have on-demand email access anywhere and anytime. Today, email is the core business communication channel. Since its inception, email has evolved from a simple intra-office messaging tool to the information and communication backbone for companies of all sizes. As reliance on email grows, so does the need to ensure its uninterrupted operation and to preserve the information it contains. Excessive data loads, the constant pounding of spam and viruses, unplanned service interruptions, and ad-hoc needs to locate pertinent information within the flood of content present constant challenges for business owners and their staff. RADAR solves these problems. It is easily deployed for any size business to ensure that electronic communication is automatically preserved for intelligent discovery, rapid recovery, and continuous access from any location. The structure of email, its constant use by staff, and its dual purpose as a communications tool and information repository demands that its retention be managed more dynamically than regular files and folders. This is accomplished through active archiving. RADAR’s active archiving automatically stores a copy of all incoming, outgoing, and internal email in a secure, encrypted, off-site repository for up to seven years. eDiscovery refers to the process of finding email in the active archive. RADAR provides a unique set of eDiscovery tools that empower users to perform multiple levels of live search for any email or attachment within the archive. RADAR’s proprietary DeepLink™ discovery engine enables users to locate relevant and related emails and attachments quickly and easily from their mailbox archive. Authorized users are permitted to search across the entire enterprise. Using RADAR’s web interface, users can instantly recover any email or attachment from the active archive into their desktop inbox without assistance from IT. RADAR’s unique “click and pick” data packaging tools allow the recovery of email and attachments to be fully customizable by the user. In the event of a catastrophic failure, a full mailbox restore is available to users for complete disaster recovery. As a hosted service, RADAR provides continuous on-demand access to email from any location. In the event of any internal network or server outages, users can access the secure RADAR servers via a webmail client to continue email communications without any down-time, mail queuing, or sender bounce-back messages. In addition to complete mobility and 24x7 email accessibility, RADAR enables email users to access ALL email and attachments within the active archive, not just the email residing on the in-house mail server. In addition, employees are not constrained by local configuration requirements or network access availability, as they are simply sending and receiving email securely within RADAR via an encrypted SSL internet connection. Delivered as a hosted service, RADAR is easy to deploy and operates seamlessly as a gateway to your existing IT network. All inbound and outbound email and attachments are indexed, encrypted, and stored in real time for rapid access. With powerful email discovery tools, including our exclusive DeepLink™ technology, users can instantly search the archive for any email or attachment, with very fast results. 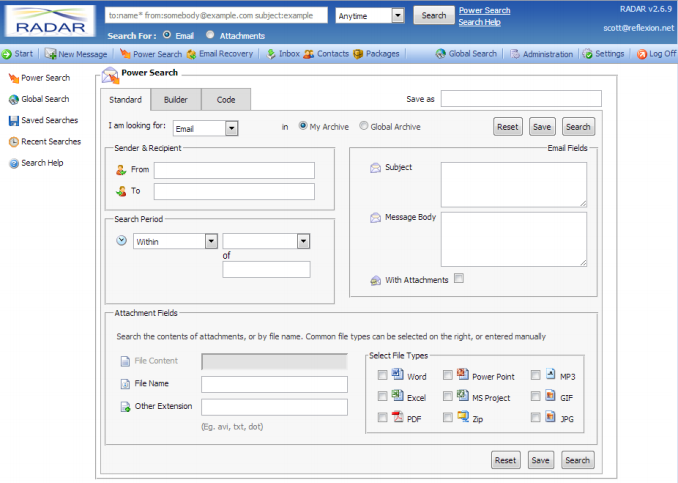 Customized email “packaging” allows users to recover their search results from the active archive back to their inbox. An integrated webmail client enables users to access the RADAR archive 24x7 from any location to ensure continued access to email during power failures or in-house server outages. What Is a Hosted Gateway Solution? RADAR operates transparently in the cloud, automatically saving incoming, outgoing, and internal email. Importantly, this does not require any additional hardware, client-side software, or IT support. Email availability becomes like electricity availability: it’s just there -- but even better, because if your local power goes out, you can still reach your email from another location. Reflexion’s servers are located in a Class-A datacenter that employs secure and redundant infrastructure to provide our customers with superior email availability. All incoming, outgoing, and internal email is automatically archived. All email and attachments are filtered for spam and viruses, which are eliminated, indexed for search and retrieval (discovery), and then encrypted in the active archive for secure, long-term retention and easy access. Using RADAR’s web interface, users are able to instantly identify and retrieve email and attachments, recovering them directly to their desktop. Download the Sophos RADAR Datasheet (PDF). For 1,000 users or more, please request a quote!